The only room that is complete in our home is my baby boy’s. Since we moved in when I was 7 months pregnant, I didn’t have a whole lot of energy to get his room ready. When he was born, there wasn’t anything on the walls. But slowly, his room has come together over the last few months. I love how it turned out! Do you spy the little baby?! This wall art is all DIY and re-purposed from other areas of the house. I painted the sailboat a few hours before the contractions started. Talk about leaving things to the last minute! His changing table is also his dresser. We re-purposed a dresser that was from our guest room. The ribbon mobile was made from ribbons from the diaper cakes I received at my showers. Caleb LOVES to look at himself in the mirror or at the mobile while I change him. My MIL made the striped curtains, and I love them. 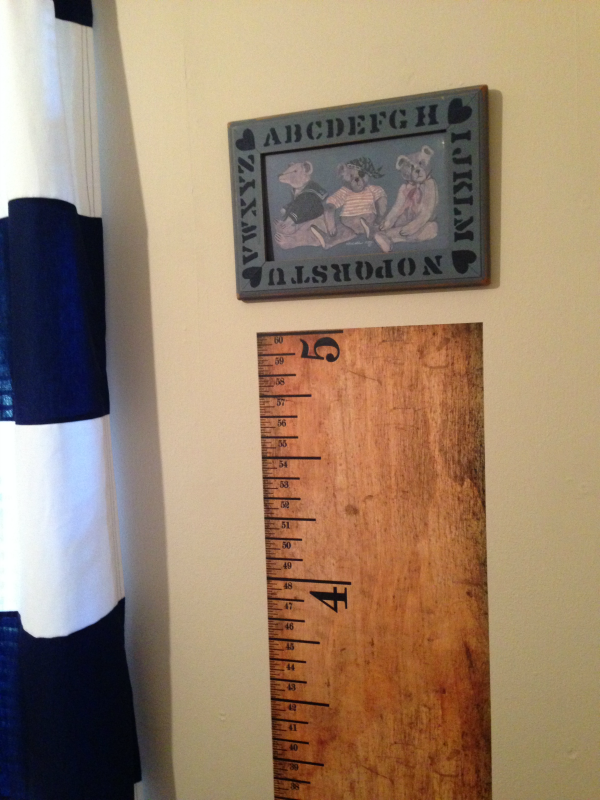 The only wall art that I bought was the measuring board sticker. 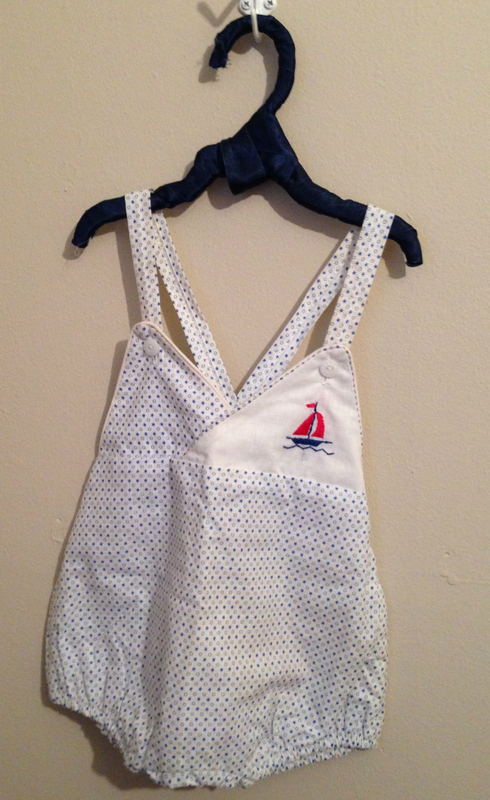 The baby outfit on the wall was my dad’s when he was a baby. This shelf holds the baby monitor, humidifier, basket of burp clothes, and books. The book end is a mason jar filled with sand, a tea light, and a buoy. It was a centerpiece at one of my showers. I’m so glad the room is completed, for now at least! Linking up with Simple Details, Best of the Nest. 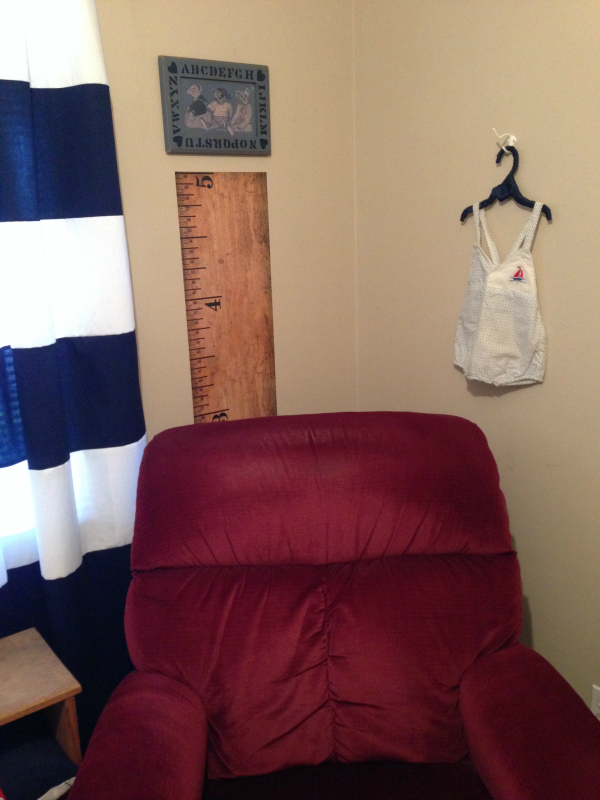 Emily, your nursery is so adorable! Especially the little bundle in the crib 🙂 (Congratulations by the way!) such a great idea to use the dresser as a changing table, babies love to look in the mirror! Your striped curtains are fabulous, I love the navy & white.